The province of Ourense is well known for having taken advantage of a thermal heritage that extends its history over the centuries. The thermal baths of Prexigueiro or A Chavasqueira, the spas of Lobios or Laias, the springs of Cabreiroá or Sousas… The southern territory of Galicia is undoubtedly prolific in medicinal waters. If we add to this some spectacular landscapes, the result is places like the Cortegada baths, in O Ribeiro region, where the landscape is as important as the thermal footprint. Cortegada is forty-five minutes by car from the provincial capital of Ourense. It is a small town of just 1,100 inhabitants, peaceful, with narrow streets that descend little by little towards the Miño river. It was here that spent his last years writer Fermín Bouza Brey. The existence of medicinal waters in the area has been known for centuries and documents dating from the fifteenth century have been found which mention them, associating them with properties of the then powerful monastery of Celanova. But it was in the nineteenth century when hydrotherapy became an especially appreciated form of tourism for the wealthy and also for those who, without being rich, sought remedies for diseases or simply for the fatigue of a hard life. At this time the thermal pools of Cortegada were little more than springs that canalised the medicinal waters, although over time booths were installed to accommodate the public that came mainly in the summer months. In winter, these ephemeral structures were dismantled and stored until the beginning of a new season. At the end of the nineteenth century, when the thermal phenomenon reached a peak, a building was constructed, but ended up damaged by the Miño currents. The successor would have to wait until the wind of history was propitious. It was finalized in 1937, which is evident in its pronounced Art Deco style. It is a building made of concrete in which stands out the exterior decoration, mainly the pediment that adorns the upper part of the door. 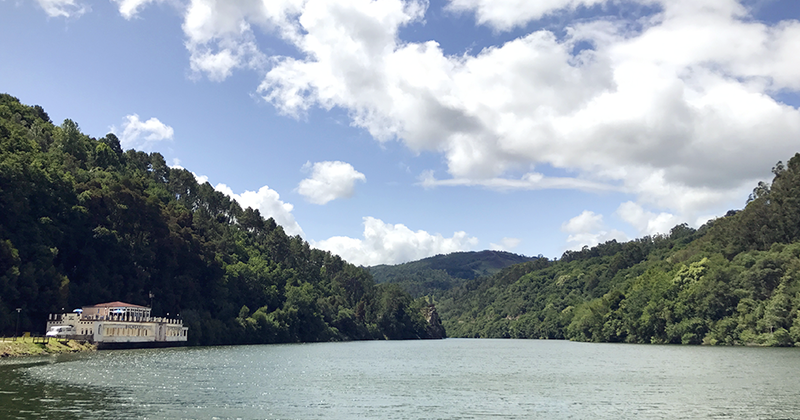 The terrace is literally hanging over the Miño, flying over the water and, at certain times of the year, practically floating on it. This was not always the case, as the level of the current increased considerably with the building in the sixties of last century of the Frieira dam, downstream, on the border between the provinces of Ourense and Pontevedra and almost on the frontier with Portugal. The old Cortegada spa attracted mainly patrons from the surrounding areas, and never reached the fame of other spas such as those of Mondariz or A Toxa, despite the richness and beauty of the nature that surrounds it. The contemporary building, inaugurated a few years ago, is located next to one of the first constructions, made in 1818 to take advantage of the so-called mountain baths, which spring on the hillside above the 1937 spa. It is a modern establishment, with contemporary facilities. To put it into operation it was necessary to, first of all, recover the original spring, lost because of the floods and the dam, reaching it with a well six meters deep. Its waters have, according to the complex’s management company, sulphur, bicarbonate, fluoride, sodium and lithium, and come from the subsoil at a temperature of 26 degrees Celsius. They are beneficial for diseases of the skin, the digestive system and the liver.